When we were on vacation in Cagayan de Oro last March, their presentation of rice had the most profound impact on me. They serve their rice in woven palm leaves! I like the presentation because the leaves lend a certain aroma to the rice. 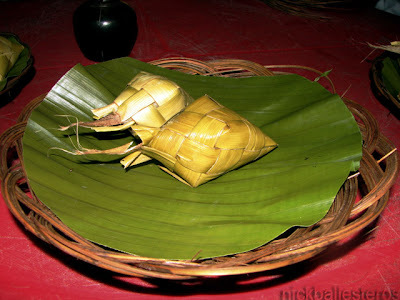 It also looks like my favorite patupat, a form of rice cake in Dagupan whereby glutinous rice is cooked in a similar way, then dipped in a sugary syrup and cooked further. It's good to know that certain customs are still practiced in our country inspite of the hustle-bustle of city life. We call it "puso" in Cebuano Bisaya. This is an example of the ingenuity of our ancestors: this way the food (rice) is made portable and safe from insects, convenient to eat when needed - even while on the go. In the public markets in Cebu, you can ask for "puso". They are conveniently hanging in the carenderias. Rudy: that's right! I heard them call it "puso". It's a really attractive yet efficient way of storing rice. I wish we had that in the North.